Lately dinners have been a bit of a struggle, as Soren fusses and wants to sit all over the house. He doesn't want to sit in his highchair, or at the table, or on one of our laps... it's a constant 'no,no,no' as he tries to figure out what he wants. 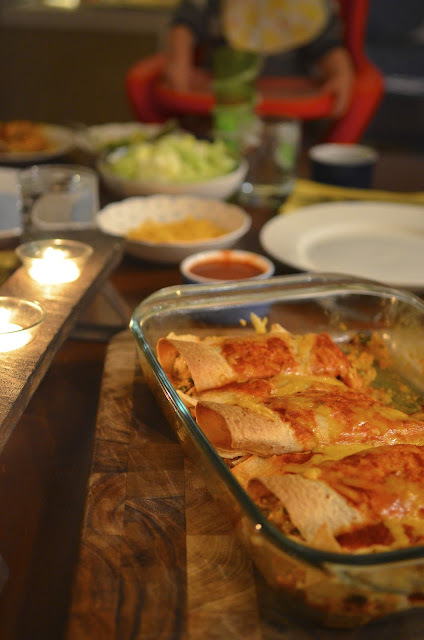 Hoping to spare the nighttime tantrums, I decided to make his all time favourite meal - Chicken Enchiladas. I was so prepared that I even made the chicken and the sauce a day ahead, so we could eat by 6:30 and the Littlest could enjoy it. Enjoy it he did not. Instead, he turned up his nose completely and only drank his milk. sigh... We tried to enjoy it as best we could, ignoring the squeals and protests from the head of the table. Why is dinner always the hardest times for babies? chicken enchilladas are the way to go!! i would have definitetly enjoyed that meal - looks delicious!